This is the groundbreaking, done-for-you obstacle training program designed by Greenfield Fitness Systems head coach Ben Greenfield and top Spartan athlete Hunter McIntyre. You can click here to go to the official page for this training package, or you can simply keep reading below to get details on all nine components of this complete obstacle racing and Spartan race training plan! 8-Week Obstacle Dominator Sprint Plan – zero-guesswork training plan for 2-5 mile races. Sprint Training 4-Week Bonus Add-On – use this bonus to fill out your calendar or as a quick month-long injection of pure sprint fitness. 12-Week Obstacle Dominator Super Plan – zero-guesswork training plan for 6-10 mile races. 15-Week Obstacle Dominator Beast Plan – zero-guesswork training plan for 11-14 mile races. Beast Training 4-Week Bonus Add-On – use this bonus to fill out your calendar or as a quick month-long injection of pure Beast fitness. Ab Dominator Cash-Outs – prepare to get a flat stomach and ripped six-pack with these optional ab workouts that you can inject at the beginning of any of your workouts, use to “cash-out” at the end of your workouts, or even do as a standalone workout whenever and wherever you want. These ab workouts require minimal equipment, but will build a bulletproof core in no time flat. Dominator Warm-Ups – these warm-ups, straight from the seasoned mind of Hunter McIntyre, are unlike anything you’ve ever seen before. Rather than doing a boring jog or some leg and arms swings, you’ll instead get entertaining and unique warm-ups that will increase your fitness just by doing the warm-up itself, and have you 100% prepared to dominate the actual workout! You can also use these warm-ups for your races. Dominator Fitness Tests – You can use these unique fitness tests once a week to every four weeks as a check-in to see the crazy fitness gains you’ll make as you follow the Obstacle Dominator workouts. These are the same fitness tests that Hunter McIntyre uses to evaluate his progress, and now they can be yours too. Full access to the online training platform “TrainingPeaks”. This is a slick app that allows you to manage your workouts, get workout notifications, keep workout logs, and even upload heart rate and training data (yep, we’ve totally nerdified it for you data geeks out there and simplified it for those of you that don’t dig computers but love your phone). Straight from the mind of Hunter McIntyre, one of the world’s top obstacle course racers, we’ve got a brand new, fully updated training plan for you with 12 week short-distance, mid-distance and long distance detailed workouts from Hunter, along with Hunter’s secret tips, techniques and training strategies for maximizing every last second of your training, and gaining the ultimate combination of speed, strength and stamina that a guy like Hunter possesses. Just imagine – with a few simple obstacles in your backyard or garage that you can go practice with anytime you’d like, your fitness and skills are going to absolutely explode! For Spartan spears to cinder block drags to full-on training walls, for just a few bucks at the hardware store (and the most basic and easy of construction skills!) you’ll discover how to make everything you need. We’re talking over three hours of pure obstacle course training and racing gold, with clearly demonstrated instructions from the Obstacle Dominator team. You simply sit back and soak up the knowledge! 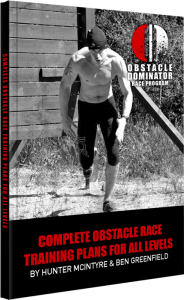 Obstacle Dominator Training Manual: 6 Complete Obstacle Race Training Plans For All Levels – never guess about training again (includes TrainingPeaks version too!). NEW! 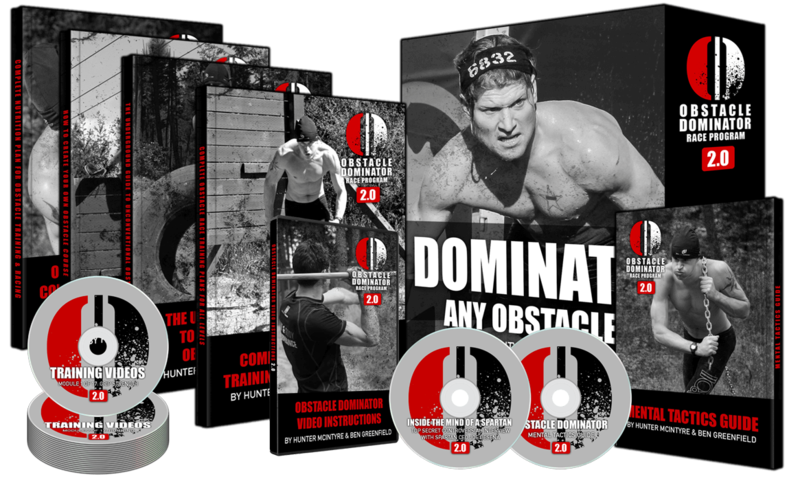 Obstacle Dominator 2.0 Training Plan – top-secret training methods of Hunter McIntyre revealed. Pro Athlete Insider Interview Series – tap into the minds of the experts. Obstacle Dominator Video Instructions – learn the exact skills to conquer every obstacle. How to Create Your Own Obstacle Course – discover how to make your own affordable and easy obstacles. Inside The Mind Of A Spartan: Top Secret Controversial Interview With Spartan CEO Joe DeSena – glimpse inside the mind of the world’s most influential man in obstacle racing. Obstacle Dominator Fuel: Complete Nutrition Plan for Obstacle Training & Racing – burn fat, build lean muscle, and never run out of energy. NEW! Complete Obstacle Dominator Video Course – over three hours of HD video content that takes all the guesswork out of obstacles. NEW! Obstacle Dominator Mental Tactics Guide – the same Navy SEAL systems used by the world’s top warriors before they go to battle. I just ordered the package and I have the same questions as Steve. The downloads are missing the video content. Hi Chad, When you purchase the Obstacle Dominator 2.0 package you receive one email titled "Your Greenfield Fitness Systems order from …… is complete – download your files" and that contains 8 download links comprising of the plan and guides etc. Within a couple of minutes of that you get a 2nd email titled "Your Obstacle Dominator 2.0 Package" and that contains the Pro athlete links, video instructions, video course as well as the training Peaks links. Do you have both the emails? If not, it is possible one ended up in your junk/spam/promotions folder since they arrive so close together. If this doesn't resolve the issue, let me know and I'll get the email re-sent to you. We want to make sure that you receive everything in the package and are completely satisfied. The plan is a little unclear. You break the training up into weeks, and then list a bunch of exercises, part a, part b, and so on, but never say what to do on what day? Below is week one from your guide (feel free to delete but please answer) when do I do what? Content that was included in this package is great, but I didn’t get all content that was advertised. I didn’t receive the pro athlete interviews or the obstacle video course. I’m not sure if I’m supposed to receive those via a different method than the digital download. If so, this wasn’t clear in the advertisement. Would give this training plan a 5 if I had received all the content. Steve, I am having my team reach out to you to make your you got everything advertised.